“The Diocese of Texas has an annual goal of planting three new congregations each year. This is a bold vision and it takes bold and courageous people. 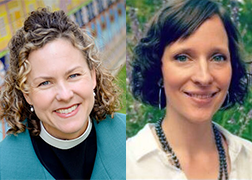 I am so excited and proud to join the staff and others in celebrating the call of the Rev. Brin Bon who will plant a church in Austin, and the Rev. Carissa Baldwin-McGinnis who will plant a church in Houston. Brin and Carissa are joining us in our work of sharing the good news of God’s reconciling work with the world around us," said the Rt. Rev. C. Andrew Doyle, IX Bishop of Texas. The Rev. Carissa Baldwin-McGinnis, part-time associate rector at St. Andrew’s, Houston has started in her new role as church planter, working on establishing a new community in Northeast Houston. She will take on this project full-time early 2019. “I am as thrilled as I am dazed by the unknown that awaits me. The new ministry to which I have been called will be an adventure and challenge not only for me but also for my family,” said Baldwin-McGinnis. The Rev. Jimmy Grace, rector of St. Andrew's who works alongside Baldwin-McGinnis, believes she is uniquely gifted to be priest in charge of a new congregation and possesses all the tools to be successful. "She has enriched the life of this parish over the past three years through her gifts of preaching, leadership, administration and passion for outreach and social justice," said Grace. Baldwin-McGinnis is a native of Austin and was a member at All Saints Church on the UT campus. She is a graduate of Wellesley College and began her non-profit vocation in Washington, D.C. in the field of human rights. Baldwin-McGinnis graduated from the Seminary of the Southwest in 2007. Her wife, Pam and two children will support her in this new endeavor. Bon was raised in Utah. She is married to J. Elijan Powell, has three children and loves the outdoors. She graduated from Yale Divinity School in 2013 with a Master of Divinity. The Diocese of Texas has 11 church plants, and one more will be added. This year that will bring the number to 12, all signs of a mission-oriented diocese. (Along with four second sites, 21 campus missions, and 88 missional communities).